Juniper Networks stands to gain from the entrance of Netflix into Australia, according to executives at the networking equipment supplier. The networking company is helping telcos around the world face Netflix and other challenges created by over-the-top (OTT) providers, executives said this week at a Juniper APAC event in Singapore. Telco customers of Juniper in Australia include Telstra and Optus. Netflix announced last month that it would bring its video streaming service to Australia and New Zealand in March 2015. The expected increase in traffic resulting from the popular streaming service could require major investment by ISPs in their networks. That could drive business to Juniper and other companies that sell services to increase network capacity and manage high levels of traffic. The Netflix impact could become even greater as the ISP provides more 4K, super high-definition video, said Steve Shaw, director of service provider marketing at Juniper Networks. Netflix has promised 4K content for the Australian market. Juniper Networks senior vice president of strategy, Mike Marcellin, said Netflix has ratcheted up traffic on networks in every market it’s entered due to a combination of strong content and a low monthly price. The service costs $7.99 per month in the US. “I talk to lots of customers around the world, and basically, the amount of traffic growth on the network is directly proportional to whether Netflix is in their country or not,” he said. Preparing for this traffic growth requires ISPs to make a major investment in network technologies, he said. “You have to solve that with technology innovation … If your network’s been growing 20 per cent and suddenly it’s growing 40 to 60 per cent,” the required response will be more than “little tweaks,” he said. Telcos must look for ways to both provide more bandwidth and simultaneously alleviate bandwidth issues on the edge, said Skingsley. This includes content delivery systems and bandwidth management techniques, he said. Netflix is just one example of the challenge telcos are facing from the rise of OTT providers, and a major way telcos are meeting this threat is by providing services beyond connectivity and bandwidth, said Juniper executives. 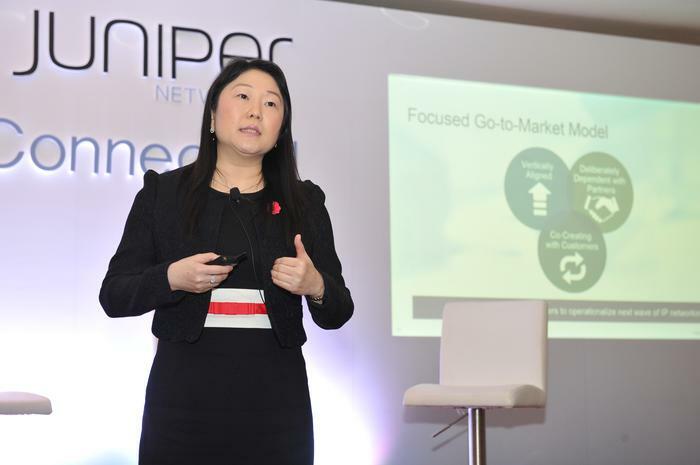 “For service providers, it’s really about [aspiring] to become the next cloud providers,” said Wendy Koh, Juniper Networks senior vice president APAC. A recent report by the Australian Communications and Media Authority (ACMA) found that the mobile market has reached a saturation point, with the number of mobile services declining for the first time in 2013-14. The ACMA also noted the rise in popularity of OTT services, which ride on telecom networks without paying any toll to the network operator. In response, Juniper’s service provider customers in Australia are “looking at how they move their connectivity platforms more towards a high-value services platform,” said Skingsley. Compared with other global service providers, Telstra “is really out in front,” said Marcellin. Telstra is working with Juniper to deploy software-defined networking (SDN) and network functions virtualization (NFV), he said. In owning the network and already having an established relationship with the customer, telcos should have a major advantage over OTT companies, he said. Doing NFV and SDN is a “matter of survival” for telcos, said Shaw. However, it won’t happen overnight, he said. Adam Bender travelled to Singapore as a guest of Juniper Networks.